Thin, lifeless hair is a common complaint, yet few women know the best remedy. Heavy conditioners will just leave your hair limp. A better bet is to use products with silicone, such as dimethicone or cyclomethicone. These coat the strands with a thin film, creating fuller hair that doesn't look greasy. The silicone stays put even after you rinse. The same nutritious foods that are good for your body promote stronger, healthier hair. 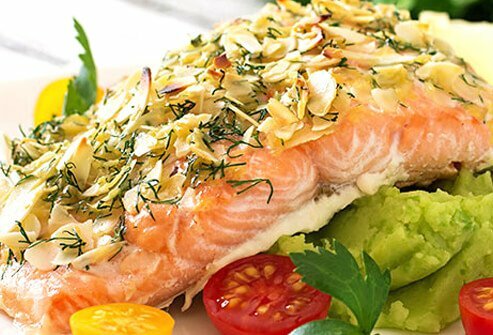 Load up on salmon and nuts! Their protein and omega-3 fats help create a healthier scalp. Leafy vegetables, beans, and carrots are also good for your tresses. Beware of fad diets aimed at quick weight loss. They can starve your body of important nutrients, which can lead to brittle hair or hair loss. Hot water can strip the protective oils that act as a natural conditioner. And your hair's natural shine can disappear. This doesn't mean you have to suffer through cold showers to avoid dull hair. Instead, use lukewarm water to wash your hair. Pamper the scalp by massaging it while you shampoo. If you often style your hair with hot tools -- or you color, bleach, or perm a lot -- you can damage hair's protective outer layer. The result is "split ends." Thankfully, there are hair products to help mend the damage. Look for conditioners with protein. They sink into the hair shaft and repair split ends. The fix only lasts until the next shampoo, so you'll need to use them regularly. 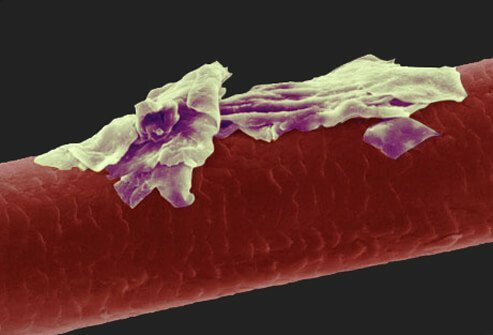 The fullness of your hair is in your genes -- and your styling technique. 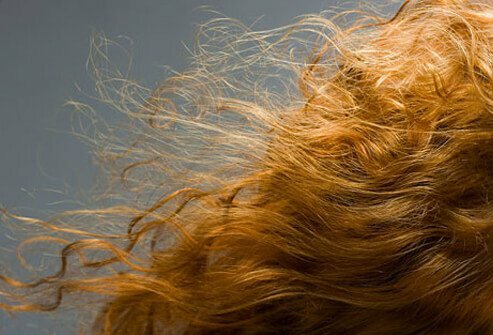 Natural redheads have thicker hair, while blondes have the thinnest but greatest number of hairs. Luckily, you can plump up the volume whatever its color. Use a leave-in conditioner or mousse and dry the root area first. Flip your hair upside down as you dry, for an extra volume boost. If your hair is very fine, use low heat with any hot tool. Dandruff is not a type of dry skin at all -- despite the white flakes that float down to your shoulders. A minor skin disorder of the scalp is to blame. Rubbing oil into the scalp can just make it worse. Shampoos with medicine are the best fix -- from a drugstore or a dermatologist. Leave the shampoo on for 5 minutes to soak into your scalp. Be sure to rinse thoroughly. You might expect a powerful blow dryer to slice a few precious minutes off your styling routine. But in a comparison of blow dryers, Consumer Reports found they all dried hair in about the same amount of time. Some are much noisier than others, though. The group found the more expensive dryers were the quietest, and the noisiest were as loud as a lawn mower. Don't believe that myth about 100 brush strokes a day. Too much brushing will snap off hairs. Some hair loss is normal – most people lose 50 to 100 hairs every day. These have stopped growing and have reached a resting stage. To keep from losing any more hair than normal, use a brush with ball-tipped bristles. And never brush wet hair; use a comb instead. Ponytails and braids are great ways to showcase your personal style. But when they're too tight, they can break off hair and damage the roots. Wearing a tight style around the clock can even make your hair fall out. Set your hair free every night! For braided styles meant to last months, leave hair a little loose at the scalp. If you wear heavy extensions, give your hair a break after three months. What are you really getting for extra money spent on specialty products? 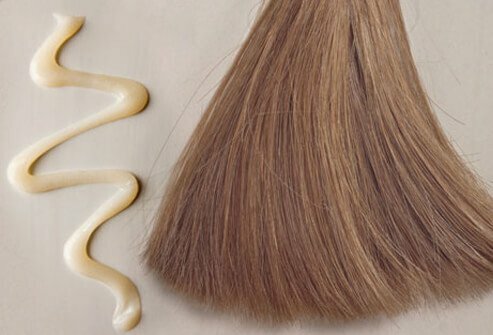 Consumer Reports tested products on 1,700 ponytail samples and found that pricey shampoos were no better than cheaper ones. What should you buy? Choose shampoos and conditioners designed for your hair type, such as those for oily, fine, or color-treated hair. Hair doesn't just change color as we get older – it also becomes weaker and grows more slowly. That means damaged hair won't be snipped off as quickly by haircuts. Chemicals used on "mature" hair should be weaker to avoid damage. Humidity gets the rap for causing frizzy hair days. But there's more static electricity when the air is dry. This means frizz also flies in winter months and in the desert climates of the Southwest. Use conditioner to stop static electricity. Shampoos that are pH-balanced also can calm the frizz for hair that's colored or relaxed with chemicals. Curly hair is more likely to break and become dry and brittle. Gently using a pick keeps curls looking better than combing or brushing. Conditioners with polymers can smooth hair and make it more manageable. Look for polyvinylpyrrolidone on the label. Don't overdo the use of flat-irons and relaxers, which can damage hair. Perhaps you're a brunette who always wanted to be a blonde, or a blonde who wants to go darker. Be aware that you're risking damage to your hair with more extreme color changes. 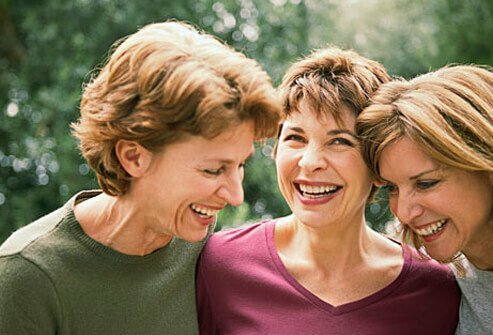 Some dermatologists recommend staying within three shades of your natural color. Frequent blow-drying is hard on your hair and can actually lead to hair loss. When you do blow dry, turn down the heat. Finer hair is especially sensitive to damage from heat, but even thick manes need some tender care. Protect your hair before styling by using a conditioner or a heat styling product. The sun is no kinder to your hair than it is to your skin. Sun exposure can dry out hair, especially if it's color-treated. 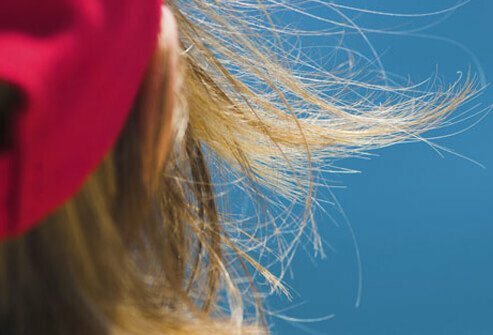 Use a light hair spray with SPF protection -- or wear a hat when the sun is strongest. 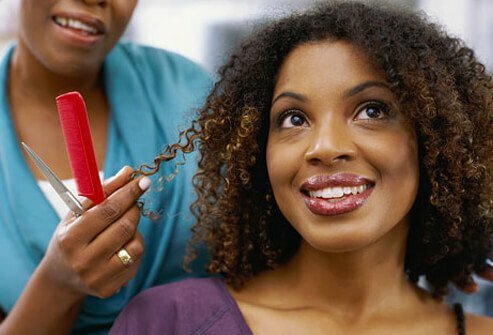 Frequent summer trims can keep your ends looking healthy. Avoid chlorine damage by rinsing your hair before entering the pool or wearing a swim cap. 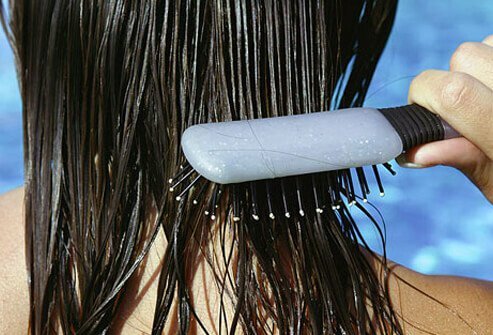 If your hair is already saturated with water, it won't absorb as much from the chemical-laden pool. Use a pH-balancing hair product to further protect your hair. For better hair days, the best thing you can do is -- nothing. All the tugging, combing, brushing, drying, and chemically treating of hair damages the shafts. Even vigorous towel-drying can damage hair. Gently blot wet hair with a towel. If you have damaged hair, take a break from styling. As the damaged hair grows out, the new growth will be healthy. 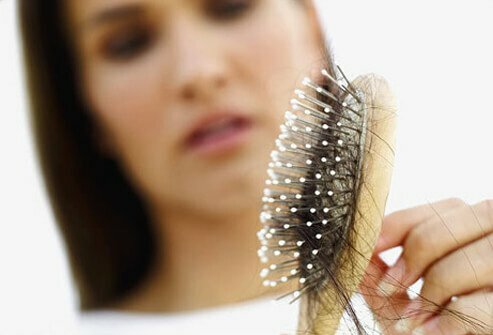 Sudden changes in your hair, such as brittle hair or losing much more hair than usual can in rare cases be a sign of a health problem. 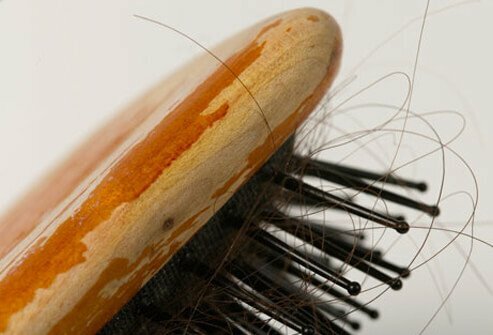 Some medicines can cause hair loss, too. If you notice dramatic changes in your hair, see a dermatologist. Zoe Draelos, MD, dermatologist, High Point, NC.